Today, July 5 is the Birthday of Sufi Master Hazrat Inayat Khan (1882 - 1927). The Indian mystic and musician Hazrat Inayat Khan, born on July 5, 1882, was the first teacher to bring Sufism, Islamic mysticism, to the West. He put the accent on the inner life and the annihilation of the false self. In his teachings, Khan emphasized the importance of developing what he called "the art of personality," which includes the following character qualities: respect, consideration, hospitality, humility, graciousness, tenderness of feeling, sympathy, moderation of speech, and modesty. The yearning for God, he taught, produces a way of life that is courteous and loving and thoughtful of others. He was born into one of the most musical families in the country. 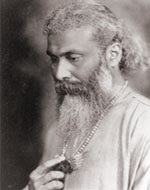 Inayat's grandfather, Maula Bakhsh, known as the 'Beethoven of India,' had become a master of the music of both North and South India, a feat hitherto considered impossible, and had then, at the invitation of the Maharaja Khanda Rao, settled in Baroda where he founded 'Gayanshala,' the first musical academy of its kind in India. Maula Bakhsh drew about him many people of culture and refinement. Among his students and associates was Rahmat Khan, who came from a family of musicians, poets and mystics. Rahmat married Khatidja, the second daughter of Maula Bakhsh, and their first child was Inayat. Inayat quickly showed great musical talent, and before he was twenty he was singing and playing the vina in the courts of royalty all over the subcontinent. Indeed, from a set of recordings Inayat made at the age of 27, modern musicologists are able to say that his vocal skill and musical understanding remain unequalled to this day. Called to something beyond worldly success, however, he at last met his Murshid, Sayyed Muahmmad Abu Hashim Madani and entered the Sufi path. On September 13th, 1910, destiny brought Inayat to west, sailing from Bombay first to America, and travelling thence to Europe. In this he was fulfilling the last words of his Murshid, "Fare forth into the world, my child, and harmonize the East and West with the harmony of thy music. Spread the wisdom of Sufism abroad, for to this end art thou gifted by Allah, the most Merciful and Compassionate." During the next sixteen years, Inayat founded the International Sufi Movement and travelled widely, inspiring many and teaching the Sufi Message from California to Moscow. In America, he met the woman destined to become his wife and companion, Ora Ray Baker. Their first child was born in Russia, and the remaining three in England, where they sheltered during the First World War. In the early 1920's, the family settled in Suresnes, a quiet suburb of Paris, and here Summer Schools were held for the growing number of students. The lectures given here and elsewhere have subsequently been published under such titles as "The Unity of Religious Ideals," "In an Eastern Rose Garden," "The Mysticism of Sound," "Love, Human and Divine," and "Health, Mental Purification and the Mind World." In 1926, Inayat returned for a visit to India, leaving his family in the West. After a brief illness, he passed away in Tilak Lodge, New Delhi on February 5th, 1927, at the age of 44. Indeed we are from God and to Him is the Final Journey. 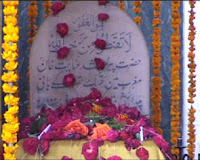 According to his wishes, his body was laid to rest on a small piece of property not far from the grave of the Sufi saint Hazrat Nizamuddin Aulia. 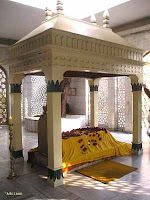 The Dargah (tomb) of Hazrat Inayat is now a place of peace, prayer and meditation in the midst of the crowded city to which pilgrims come from around the world. The greatly illuminated souls who effacing their own self merge in God, they may leave their earthy body, but in truth remain alive. The ordinary death is not destined for them. By the permission of God, the Most High, they constantly guide their devotees, guide different souls in different mode of guidance - sometime appearing in spiritual dreams, sometime in vision giving direction, inspiration and also through their illuminated writings, teachings and legacy. 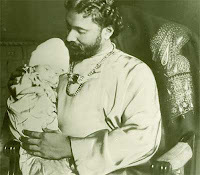 on a personal note, i am immensely greateful to the teachings and philosophy of Inayat Khan. If there is a single Sufi Master i am to name who helped me in this path most, to help me develop an appreciation for the essence of truth of various world religions and including the rediscovering the beauty of Islam, it has to be Master Inayat Khan. It is through his inspirational writings that initiated me where i am. May peace, blessings and love of the Source be with him. May God sanctify his secrets and elevate him among the elects. May Master Inayat Khan continue to be source of inspirations to many and help open their hearts to highest truth.